SRIHARIKOTA: A day after the last of diwali rockets was fired in this part of the country, “the big one” blasted off from the first launch pad in Sriharikota on Tuesday afternoon, firing the ambition of a nation, and the imagination of many others. 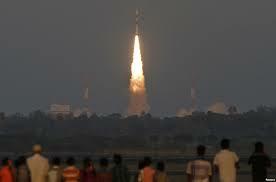 After 45 minutes, the first phase of India’s first Mars mission was pronounced a success. “I am happy to announce that the Mars orbiter mission first phase is a success,” said Indian Space Research Organisation chairman K Radhakrishnan soon after the rocket injected the spacecraft into an Earth orbit about 45 minutes of flight. About 90 minutes after a drizzle raised minor concerns about weather among lay people, the 44.4m PSLV-C25 carrying in its head India’s first Mars orbiter, lifted off from the Satish Dhawan Space Centre at 2.38pm. Drowning the cheers at the mission control, about 7km away, and the nearby media centre,” the rocket rose to the sky with a roar, spewing fire and smoke. Soon it disappeared into the clouds, only to re-emerge after a few second to another round of applause. About 58 top scientists of the Indian Space Research Organisation remained glued to their computers in the mission control that displayed the performance of the rocket as it shed its first and second stages one by one. The nail-biting — albeit expected – phase came soon after the third stage of the rocket burned out, and the blip on the tracking screens disappeared. As Isro chairman K Radhakrishnan had explained earlier, the rocket would be on a coasting phase for almost 28 minutes, 10 minutes of which will be a “total blind phase.” The mission control witnessed some silent moments during this period. And, when mission director P Kunhikrishnan reported that the first of the two ships in the South Pacific Ocean had picked up signal from the rocket, the scientists lit up. About 35 minutes into the flight, the rocket was cruising at an altitude “slightly higher than the expected trajectory,” as a scientist put it. “But it will self-correct its course,” he assured. And correct it did, after the fourth stage engine fired on its own, bringing the rocket back to life. Soon, the orbiter was injected into an elliptical Earth orbit in what Kunhikrishnan called a “precision exercise.” What follows in the next 10 days would be six crucial “orbit raising operations,” in the wee hours of November 6, 7, 8, 9, 11 and 16. » Hidden agenda behind Chandrababu's asset declaration?